Disturb no wine before its time. Tags easily identify wines and note pertinent vintage information without ever having to move the bottle. Organize your cellar with decorative wine bottle tags. 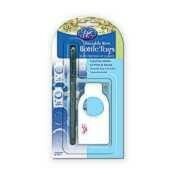 The Gift Set includes 20 Plastic Tags and an Erasable Pen.